The content of this website informs you about our Hanging Systems for picture frames and parts/equipment for serial production. Through the past years we have developed several of these Systems and we have built special machines to improve production-levels of picture-frame-production. 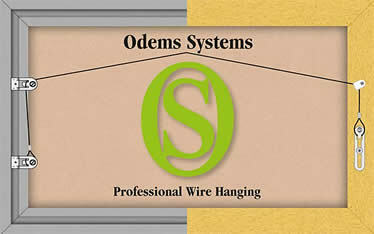 The wire-hanging-systems are applicable for all wooden frames from 250 mm / 9 7/8" to 1250 mm / 49 1/8" in max. weight 5 KG / 11 lbs. For heavier wooden frames/mirrors, our wire-hanging-systems are applicable for wooden frames from 800 mm / 31 1/2" to 1800 mm / 70 7/8" in max. weight 20 KG / 44 lbs. Frames over 20 KG / 44 lbs can better be mounted with heavy wall-plates. You can find all information, photo’s and movies through the direct links, but we have also made three clusters for covering the needs of different customers. This can help you to find your suitable products. Here you find systems for use by framers.